Last weekend’s Dragon Ball FighterZ World Tour finale in Los Angeles, California, was punctuated with surprises and excitement in just about every match. But while the talent on display was some of the densest the young game has seen over its year of competition, the circuit’s most dominant player was able to walk away with a championship that seemed like it belonged to him before the tournament even started. Ryota “Kazunoko” Inoue is unquestionably one of the greatest fighting game players of all time. He’s excelled in just about every game he’s picked up over the last decade, finding success in everything from Guilty Gear and BlazBlue to Street Fighter and Marvel vs. Capcom, and his time with Dragon Ball FighterZ has been no different. While most attention has naturally been focused on the enduring rivalry between Dominique “SonicFox” McLean and Goichi “GO1” Kishida, Kazunoko has been tallying up a series of wins leading up to the World Tour finals that put every other competitor’s record to shame. Starting with his early qualification at Community Effort Orlando and ending with a three-tournament streak that opened up a multitude of additional last-chance qualifiers at the main event, Kazunoko has been the most impressive Dragon Ball FighterZ player of the last year based on results alone. Coming into last weekend’s World Tour finals, his victory felt all but assured, even with fellow qualifiers like SonicFox, GO1, and Eduardo “HookGangGod” Deno in attendance. But before these titans could be set loose, the championship bracket would need to be filled by on-site qualifiers, and it’s there that Kazunoko’s most fierce competition would earn his chance at the crown. Shoji “Fenritti” Sho’s history in the fighting game community is not as long as Kazunoko’s. He first gained global recognition as a brilliant BlazBlue competitor, qualifying with teammates for two Japanese championships in 2012. Since then, he has become one of the best BlazBlue players in the world. Since Dragon Ball FighterZ’s release in January 2018, Fenritti tried his hand and found success at both local and major competitions. Last November, he narrowly missed out on securing a spot in the World Tour finals with a loss to Kazunoko at Japan Round, but Fenritti did earn a trip to Los Angeles with that performance, which meant he had one last shot at making the championships through the last-chance qualifiers. Over the course of one day, Fenritti participated in four excruciating, single-elimination brackets. He fell short in the first three with losses to Ryo “Dogura” Nozaki and BNBBN, both of whom went on to qualify for the finals themselves. Finally, in the last of the last-chance qualifiers, Fenritti secured the win he needed to make the main event. 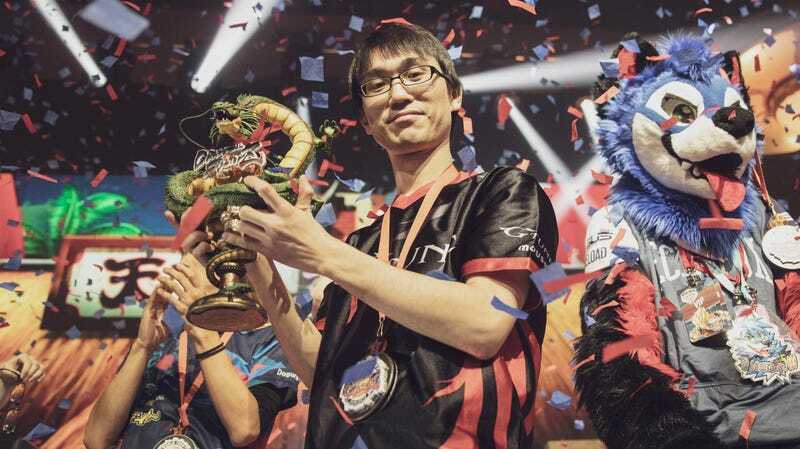 His opponent in this grand finals match, Naoki “Moke” Nakayama, was another favorite in the Dragon Ball FighterZ scene, but when push came to shove, Fenritti won and qualified, leaving Moke on the outside looking in with almost 200 other competitors. Fenritti’s opening opponent? Kazunoko, the player who had kept him out of the World Tour finals in the first place. Unfortunately for the challenger, Kazunoko quickly squashed any redemption arc Fenritti may have thought to establish for himself. The first match of the Dragon Ball FighterZ World Tour finals saw Kazunoko absolutely demolish Fenritti with a quick 3-0 victory. From there, Kazunoko notched a second win against Dogura before facing stiff competition from GO1 in the winners finals. Piccolo, the latest addition to GO1’s repertoire, played a big part against Kazunoko. In undermining Kazunoko’s strongest fighters by way of snapping them out—a technique that forcefully removes the opponent’s current character and slots in one of their backups—GO1 was routinely able to set up of Piccolo’s Hellzone Grenade, a massive super attack that locks down the opponent and allows mixup opportunities. But Kazunoko’s team, which is made up of some of the strongest characters in the game, is nothing to scoff at. Gotenks, who is equipped with a super that provides similar benefits to Hellzone Grenade, serves as Kazunoko’s point character, backed up by Adult Gohan, a strong character who gets even more powerful over the course of the match, and Yamcha, one of the game’s best assists. GO1 managed to go up 2-1 at one point, but Kazunoko’s understanding of the game was just too much, even with GO1’s incredible defense. Kazunoko forced a decisive final game in their best-of-five matchup, in which he wiped the floor with GO1, who ended up being unable to eliminate even one of Kazunoko’s characters. Elsewhere in the tournament, Fenritti was proving his own strength in the losers bracket. While he avoided having to play Evo 2018 champion SonicFox, who suffered a surprising and uncharacteristic elimination at fifth-place, Fenritti did come up against the one other American in the finals, HookGangGod. He would defeat his only non-Japanese opponent with a clean sweep, going on to eliminate Cyclops Osaka teammates Dogura and GO1 before earning a rematch against Kazunoko in grand finals. Fenritti had played an immense of Dragon Ball FighterZ up to this point. The young challenger had fought his way through 30 matches over two days compared to Kazunoko’s three in the World Tour finals, a monumental feat even for the most battle-hardened competitors. After defeating GO1 in the losers finals, Fenritti was given a lengthy break, during which the commentary team marveled at his endurance. More than just about any other game, Dragon Ball FighterZ takes a lot out of its players. Apart from how long the matches can take even in the most constricted tournament format, the amount of pressure competitors are able to apply to opponents makes every match a stressful experience, filled with the need to recognize attack barrages and figure out how to best defend against them. When Fenritti finally sat down to face off against Kazunoko (and then between every game thereafter), he closed his eyes, took a small breath, then focused on the task at hand. What followed was an absolute rollercoaster. Fenritti took the fight to Kazunoko immediately, throwing him off balance with his team of Perfect Cell, Bardock, and Super Saiyan Vegeta. Pretty much every team composition in Dragon Ball FighterZ includes some sort of shenanigans to open up the opponent’s defenses, but Fenritti’s feels the most straightforward in its singular strategy to mess opponents the heck up. Perfect Cell and Bardock are both so powerful that they can force the other player to second-guess their every move lest they get smacked in the mouth, while Super Saiyan Vegeta functions as a strong, lockdown assist who has been popular since the game’s release, despite receiving various nerfs. This combination of power and function helped Fenritti ride to a 3-1 victory against Kazunoko in the first grand finals match, forcing the bracket to be reset. This trend didn’t last, however. Whether it was fatigue from 48 hours of competition or simply because Kazunoko is just too damn good, Fenritti couldn’t maintain his momentum. He often found himself falling behind Adult Gohan, whose Potential Unleashed super makes him stronger every time it hits the opponent. Fenritti’s fighters also couldn’t quite keep up with Gotenks’ ability to confuse opponents with complex mixups, even without Yamcha’s potent assist. In the final game, Kazunoko steamrolled over Fenritti en route to his championship, ending the match with an impactful 3-1 win and proving once and for all that he is the strongest Dragon Ball FighterZ player in the world. The Dragon Ball FighterZ World Tour finals showed that even a tournament where one player is heavily favored can be impactful and exciting. Although everyone in the bracket had the potential to walk away as the tour’s inaugural champion, the event was definitely Kazunoko’s to lose. Despite being barely a year old, Dragon Ball FighterZ has already carved out a spot for itself in the hearts and minds of the fighting game community, and competition is better for having someone at the top—whether that’s Kazunoko, SonicFox, GO1, or any of the other fantastic players who compete at a high level—to aspire towards and challenge. The next step for Kazunoko is holding onto his throne, but as Dragon Ball FighterZ’s short history has already shown, that’s easier said than done.